This book by Miguel De La Torre offers a fascinating guide to the history, beliefs, rituals, and culture of Santería — a religious tradition that, despite persecution, suppression, and its own secretive nature, has close to a million adherents in the United States alone. Santería is a religion with Afro-Cuban roots, rising out of the cultural clash between the Yoruba people of West Africa and the Spanish Catholics who brought them to the Americas as slaves. As a faith of the marginalized and persecuted, it gave oppressed men and women strength and the will to survive. With the exile of thousands of Cubans in the wake of Castro’s revolution in 1959, Santería came to the United States, where it is gradually coming to be recognized as a legitimate faith tradition. Apart from vague suspicions that Santería’s rituals include animal sacrifice and notions that it is a “syncretistic” form of Catholicism, most people in America’s cultural and religious mainstream know very little about this rich faith tradition — in fact, many have never heard of it at all. De La Torre, who was reared in Santería, sets out in this book to provide a basic understanding of its inner workings. He clearly explains the particular worldview, myths, rituals, and practices of Santería, and he discusses what role the religion typically plays in the life of its practitioners as well as the cultural influence it continues to exert in Latin American communities today. 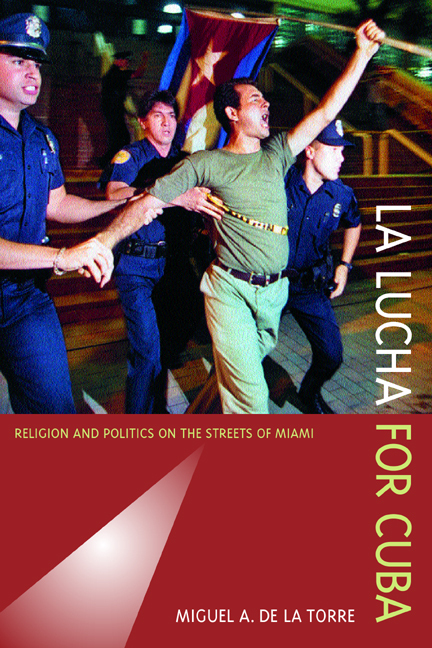 In offering a balanced, informed survey of Santería from his unique “insider-outsider” perspective, De La Torre also provides insight into how Christianity and Santería can enter into dialogue — a dialogue that will challenge Christians to consider what this emerging faith tradition can teach them about their own. Enhanced with illustrations, tables, and a glossary, De La Torre’s Santería sheds light on a religion all too often shrouded in mystery and misunderstanding.